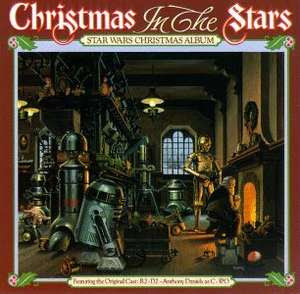 Looking for some new sounds for your annual Christmas compilation? Look no further, for I bring you (aided and abetted by the always generous Ross Hamilton) a whole bunch of new music especially for the festive season. Then we have the horrific car crash that is Billy Idol’s hash at White Christmas. Taken from his rarely-seen 2006 album Happy Holidays (and which also contains anodyne versions of Frosty the Snowman, God Rest Ye Merry Gentlemen and Auld Lang Syne amongst its 17 rotten tracks), it’s hardly the former William Broad at his lip-curling best, is it? As Ross says: “I might not have kept up with Billy's recent career (and when I say recent, I mean anything after 1988) but this was a major shock. It reminded me of a drunk pub singer going through one last number at the piano before closing time on Christmas Eve.” I couldn’t have put it better myself. And finally, and again with unending thanks to Ross Hamilton, I bring you Is There Really A Santa Clause from Red Sovine – who regular visitors to the World’s Worst records will remember for the execrable Teddy Bear. For more on Red, click here. I may be running a Red Sovine Special soon, but until now enjoy this slice of miserable Country hokum. Happy Christmas one and all! See you in 2011. I know, I know, I know. I promised you a festive feast for December and I haven’t delivered. Mea culpa. Mea maxima culpa, but I promise you all there are good reasons for the apparent inactivity. I will be back later this week with the promised Christmas bundle. But today, in an attempt to redress the balance, I bring you not one but two recordings, both sides of a 45 which I genuinely believe to be one of the worst, if not THE worst records ever pressed. In fact so obsessed have I become with this dreadful waxing that I have spent as much spare time as I have had in the last week tracking down as much info on the writer, performers and company as I could and ordering (via GEMM) several other discs from the same company. 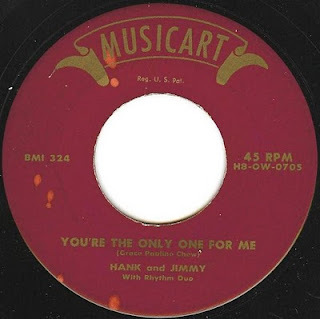 The two tracks I present to you today, You’re The Only One For Me and You Don’t Remember Any More (sic) come from the Philadelphia-based Musicart label and appear to have been released around 1956 – the height of the rock ‘n roll era. There were several other companies called Musicart operating at various times, one which seemed to license a lot of its material from South America and was operational during the 60s and 70s, and a more recent outfit specialising in Goth material, but this particular company appears to have put out the majority of its material between 1950 and 1956. Both of today’s songs were written by one Grace Pauline Chew, as was pretty much everything else put out by the company (or so it appears). Certainly of the 15 sides I’ve managed to trace to Musicart so far Grace wrote or co-wrote the majority of them. So who was Grace Pauline Chew? Born 1898 in Camden, New Jersey, Grace Pauline Chew was an American voice teacher, soprano and song composer. Her father, James Buchanan, was a concert and operatic tenor. Educated in New York and Philadelphia, she married Walter C. Chew in January 1917 and they had one son, Walter Chew, Jr. (1917-42). She made a number of concert and radio appearances during the 40s – principle of which was an extended run on radio station WSNJ (New Jersey) in 1945 – and published her first songs, Music In the Sky and Still In Love With You, in 1949 (both issued on vinyl by Musicart in 1950). She also wrote a pamphlet entitled Know How: Information for the Singer who Wants to Become Professional, in 1953. Oh, and apparently she had blue eyes. That’s it. With regards to the performers of these two ditties, there’s little I can tell you. Mamie Watson performs the funereal You Don’t Remember Any More with the ‘Musicart Ensemble’ – an out-of-tune piano and a kind of reed instrument I cannot quite put my finger on (maybe some sort of harmonium). There was a Mamie Watson who appeared on the British stage in the 1920s and a Mamie Watson also appeared in the US-produced short film His First Car in 1930, but I’ve no idea (yet) if this is the same person or these are three individuals who all happened to share the same name. 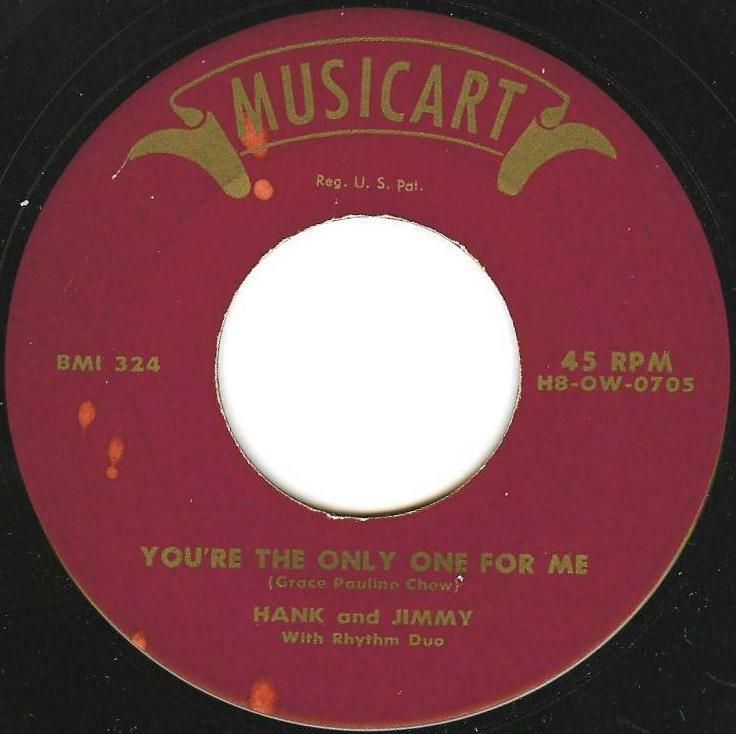 As for Hank and Jimmy, the performers of You’re The Only One For Me, their accompanists (listed as Rhythm Duo on the disc), appear to be one person playing an out-of tune village hall piano while a second clicks his fingers, kicks at the studio floor in an approximation of an attempt at keeping time and then provides a spectacularly inept hand clap solo. Awesome. I love everything about this record; I hope you do too.